Stocks ended up mixed on the week. The good news of GDP with bad news of Facebook price drop certainly increased volatility. Despite that, the markets are still on trend with a positive outlook for the future. A current market review suggests a trendy mood among the Q2 earnings season. An economy of the United States of America has grown by 4.1% in the second quarter of 2018. This is a quite strong number confirming a healthy and durable economy. Although the next quarter is certainly going to be lower, this is a good base for the stocks. From historical evidence, the stock prices tend to go higher after such good GDP results. Trump and Junker agreed to no new tariffs against EU. Trump said he will not impose tariffs on European Union and Junker promised to import more soya beans and natural gas from the US. Whether this stays like this in future is not clear at all, however, we know no more and that what market knows too. Such “no deal” can be considered as good news for the stock market at the moment. Facebook has lost $119 billion of its value on Thursday – the biggest one-day loss in the stock market history. The reason was that one of the most valuable companies on the US stock market has reported disappointing results. Facebook has had problems with privacy before and thus, the cost of damaged was more-less expected. The company will need to rethink its advertising strategy to get into the growth again. The market events have certainly an impact on the stock prices and generally on the stock market. 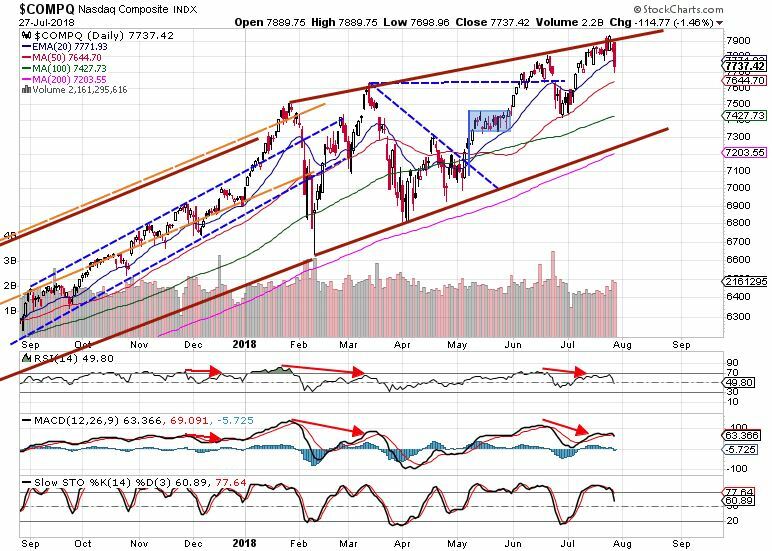 However, the general path of the market can be followed by appropriate trend observation using the right mixture of fundamental and technical analyses. 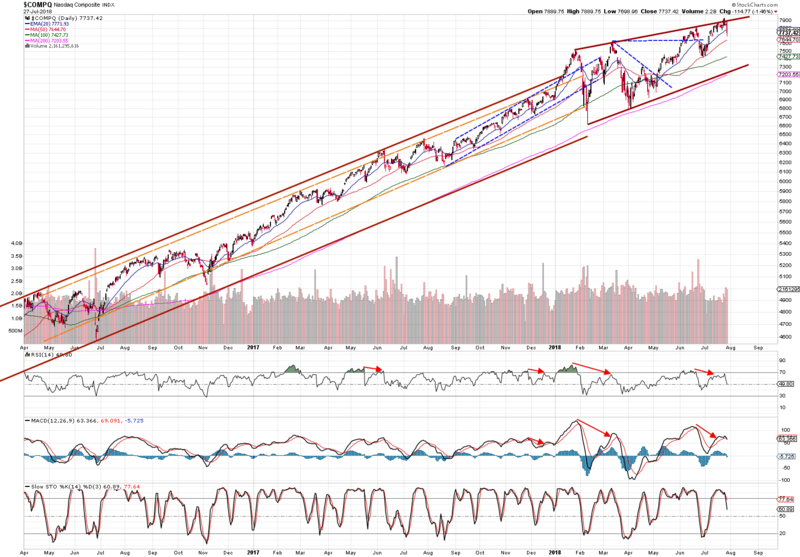 Standard & Poor’s 500 indexes managed to hit the edge of the upper line of the current bull trend channel. The current support is the blue dashed line or 20 EMA. 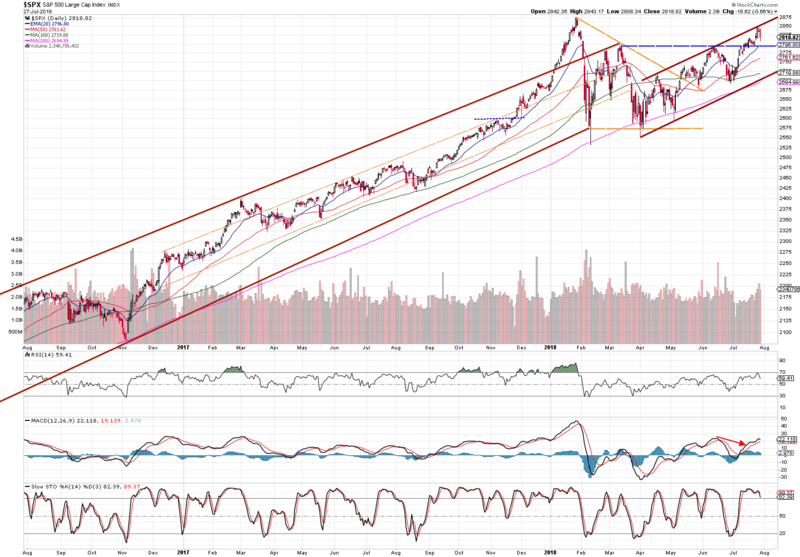 Nasdaq has been hesitating to cross its resistance depicted by brown outer trend line. Facebook helped to drag the price down breaking the 20 EMA. Note, the FANG stocks represent 50% of entire Nasdaq and thus, such price drop as FB has recently experienced, has a significant impact on the entire index. The price may likely consolidate towards 50 SMA before other big names like Google or Microsoft will lift it higher. This will, of course, depends on earnings reported. 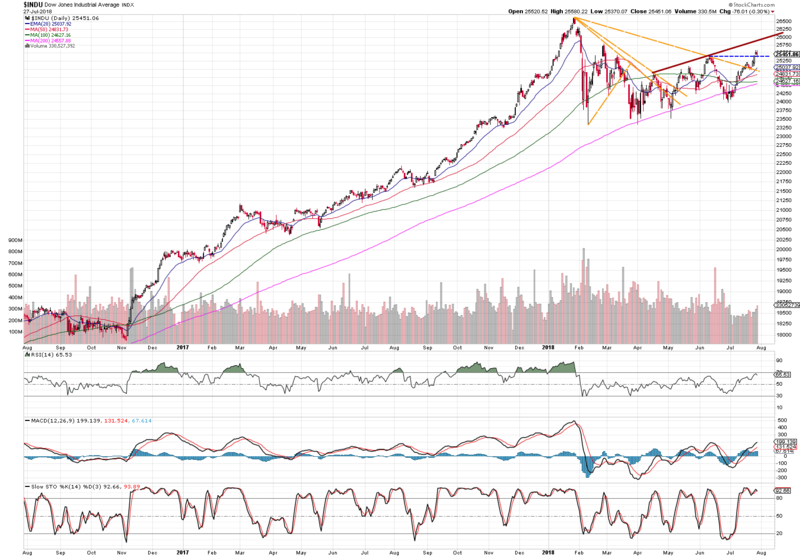 Dow Jones has broken horizontal resistance last week. This is a good sign for the index. 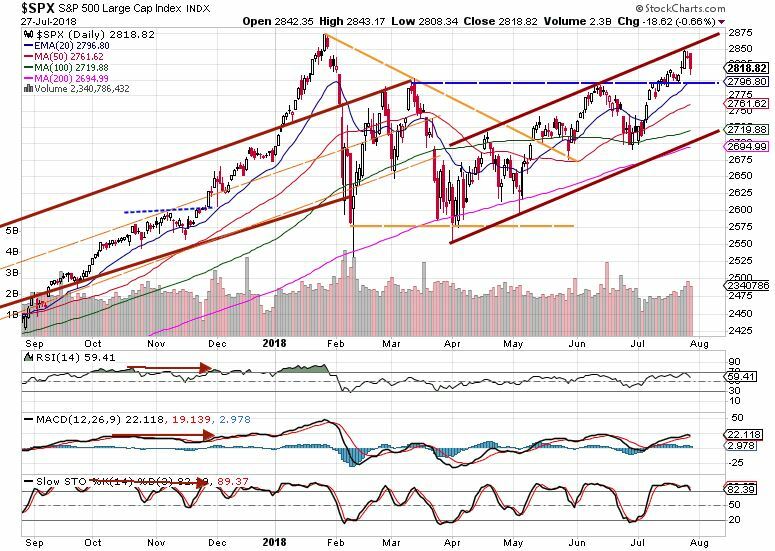 The price will probably go sideways for some trading days before it can rise again towards the outer trend line (wide brown line). FTSE is showing great trend signals. It holds the support well and has also broken short-term resistance. It is steadily rising upwards. 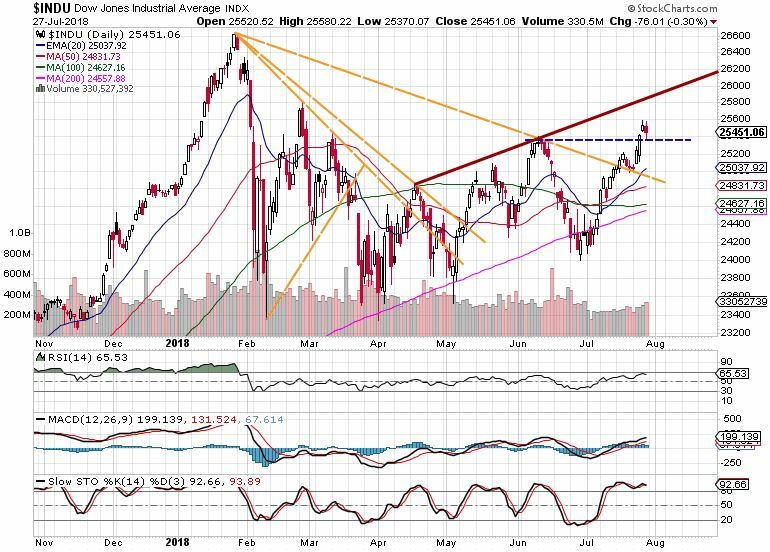 The market review suggests that this year will continue to put pressure on the market participants with its top topics: Trade war and rising interest rates. The investors should, therefore, keep rebalancing their portfolio to minimize the risks and consider also an investment in bonds as part of the portfolio.